On last night's The Biggest Loser, Bob Harper put a tree to the test when he made it serve as a piece of gym equipment. Well, with some special suspension straps attached, that is. 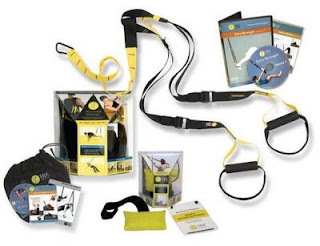 Trainer Bob introduced his gym-banned group to TRX training--a way to give yourself a total body workout using your body weight and two straps hanging from the sky. I read about TRX earlier in the year at FitSugar.com, but thought it was one of those classes where I'd to go to a specific gym or find a trainer who worked with TRX. Now it turns out, I can just as easily buy the system and set it up at home, or on the go. And at $200 for the set, over the long haul, that beats any gym membership or set of training sessions. Score for anyone not living in the Bay Area: the location for the TRX Training Center. Imagine how low you can get your body into a squat if you have something to pull up with. Or lunges and leg lifts (I saw Sione lifting his leg as he squatted back, something that would send me toppling over without supports). Think about all of those core muscles firing, the abs going into overdrive, your biceps and triceps flexing and relaxing. TRX can work the entire body through a combination of moves both in familiar and uncharted territory. And for someone who needs to work her core, it's a winner.